Photo credit: gardiole. Licensed under CC BY-ND 2.0. Picpoul de Pinet wines in their characteristic slim, dark-green bottles. Our professional association of Sommeliers-Conseil celebrated the new year with a tasting of AOP Picpoul de Pinet – the Languedoc’s largest white wine appellation, in which white wines are made from the ancient grape variety Piquepoul Blanc. Picpoul’s wines don’t have the international fame of many others in France, but that is unjustified, as these refreshing whites are delightful, accessible and represent great value. Furthermore – and this is always a big plus in Wine and Words’ book – they have great food pairing potential. and Picpoul de Pinet wines tend to balance their acidity and citrus-bitter notes with a rounder texture – a tension which makes for beautiful pairings with the local seafood, and shellfish in particular. Photo credit: sabin paul croce. Licensed under CC BY 2.0. The area of Picpoul de Pinet covers about 1500 hectares in the Hérault department, near the French Mediterranean coast, with vineyards stretched out on gentle slopes near the Etang de Thau, the largest of a ribbon of lagoons in an area better known among wine lovers for its fortified Muscat wines (Muscat de Frontignan, Muscat de Mireval, …) and for red blends of Grenache, Syrah, Mourvèdre and many other varieties. The tasting was introduced and commented by Mr. 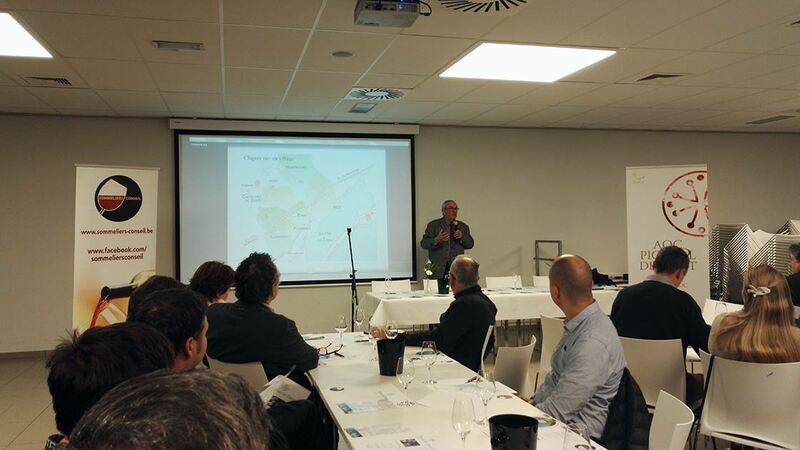 Guy Bascou, president of the Syndicat de l’AOP Picpoul de Pinet. Picpoul de Pinet has only been an autonomous denomination since 2013. Before that it was first a V.D.Q.S (Vin Délimité de Qualité Supérieure) since 1954, and then housed under the AOC Coteaux du Languedoc (now AOP Languedoc) since 1985. Only still, white wines from Piquepoul Blanc are allowed to be produced under the AOP (Appellation d’Origine Protégée, the highest category of wines with protected geographical indication). Other wine types and styles can fall back on several other AOP or IGP denominations in the area, or on the wider and less strictly regulated Vin de France category. Piquepoul Blanc is a late-ripening grape variety, sensitive to both drought and disease, which is why it thrives in the hot, dry local climate, where the warm and humid summer winds help the grapes to ripen in healthy conditions, while providing much-needed moisture. Photo credit: Mike Prince. Licensed under CC BY 2.0. Picpoul de Pinet is sometimes called the ‘Muscadet of Southern France’, but they’re definitely rounder than their Loire Atlantique shellfish-loving siblings. When it comes to aromas, however, Piquepoul shares quite a few similarities with Muscadet’s Melon de Bourgogne, presenting notes of lemon and lime, mineral impressions, hawthorn blossoms, anise-like spices, pepper and lots of fruit, which can show as green apple, pear or peach, or even as tropical fruit (pineapple) in the riper versions. The bone-dry Picpoul de Pinet wines are meant to be drunk young, in the 1 or 2 years after harvest, and well chilled, without being too cold. (We recommend 8 to 10°C). They make good and versatile food partners, which can be paired with a range of seafood dishes, from oysters to Asian seafood salads and rustic, flavoursome fish and shrimp croquettes. Féline 2015, Domaine Félines Jourdan. AOP Picpoul de Pinet, France. Picpoul de Pinet is an interesting appellation, not as well known as it deserves, delivering lightly round wines with medium-intense aromatics and surprisingly refreshing. They’re an excellent match with seafood, i.e. oysters, scallops or crab, prepared as purely and naturally as possible. This is true for this PdP as well, with its pleasing, fruity nose of yellow apple, citrus and a touch of fresh herbs, supported by a pinch of chalk and a dollop of butter. Medium(+) acidity, body & finish, with tart citrus flavours that will let the seafood sing. Beauvignac Cuvée Anniversaire 2015, Les Costières de Pomérols. The wine cellar of Pomérols was founded in 1932 and has steadily grown throughout the years, now uniting around 350 winegrowers. This Beauvignac is a bone-dry, lightly chalky Picpoul de Pinet from the 2015 vintage. This showed medium(+) acidity, a touch of roundness, lots of grapefruit (including a bitter finish), with an interesting lift from anise-flavoured herbs. A pure, straightforward white, and a versatile partner for seafood hors d’oeuvres. Duc de Morny 2016, Cave de l’Ormarine. 2016 was a good year in Picpoul de Pinet, and in this tasting I noticed I had a clear preference for these wines over the 2015s. This ‘Duc de Morny’ from a local cooperative is not the most subtle wine, but delicious nonetheless, with intense aromas & flavours of sweet, ripe citrus fruit, apricots, melon and even lychee. The ripeness is fortunately balanced by a dry palate with juicy and refreshing acidity, which makes this a good partner for flavoursome, exotic seafood dishes but also lobster & sashimi. Le Croix Gratiot 2016, Domaine Croix Gratiot. Another star Picpoul de Pinet from the favourable 2016 vintage. This too is an intense yet fairly elegant high-acidity white, well balanced, with fruity and floral flavours, from grapefruit & ripe apples to hawthorn blossoms & fennel pollen. Lightly round, with 12.5% alcohol and a medium(+)-length finish. Like many PdPs, this presents great value and it’s an excellent seafood partner for lobster dishes, oysters, prawns, salmon tartar, smoked salmon with shallots or Flemish-style artisanal shrimp croquettes. Terres Rouges 2016, Domaine Reine Juliette. Another nice, fairly priced seafood wine from the Languedoc’s largest white wine-producing appellation Picpoul de Pinet. This is one of the crispier wines among the 2016 vintage we tasted, showering the palate with vivid citrus acidity and grapefruit bitter, balanced by anise herbs, river-rock minerality and light tropical fruit flavours of unripe pineapple and pear candy. Pair with pure seafood, drizzled with lemon & olive oil. Ludovic Gaujal 2015, Domaine Gaujal. In spite of its 13.5% alcohol, this is a very refreshing summer wine, accomplished by medium(+) acidity and high citrus-bitter notes. It’s got the complexity to be an interesting food partner, without going overboard, showing aromas and flavours of lemon, grapefruit, unripe tropical fruit, apple and hawthorn blossom. An excellent partner for herb salads, light Asian seafood and butter-baked or poached white fish or salmon. Be careful with smoked or grilled foods, though: they would enhance the bitter tones. Château Petit Roubié 2015, Domaine de Petit Roubié. One of my personal favourites of the 2015 vintage Picpoul de Pinet we tasted, and not coincidentally one of the rare organic wines produced under the AOC. If you don’t like high-acidity whites, stay clear of this one, but for me this was a good find: pure, refreshing and lightly round, no false pretenses, just a pleasing, vibrant aperitif and food wine. Aromas and flavours of lemon, citrus pith, peach and a hint of monoterpenes, the herbaceous / floral / resinous notes that make many a wine more interesting. Ormarine Jeanjean 2016, Cave de l’Ormarine. Another good Piquepoul white from the great 2016 vintage in Picpoul de Pinet. 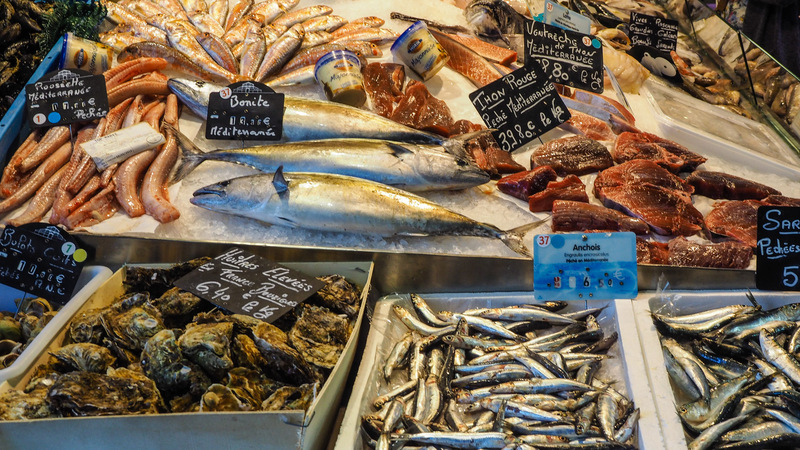 Cave l’Ormarine is the local cooperative (since 1922), and this PdP is again an excellent seafood partner, accessible in price as well as in style. We tasted it with fresh oysters, natural and unadorned, and it was a delicious pairing, with the wine’s copious amounts of citrus acidity, chalky minerality and light grapefruit-bitter nudge serving as the perfect complement to the saline sea flavours & delicate texture of the oysters. Terres Rouges 2016, Les Vignobles de Montagnac. 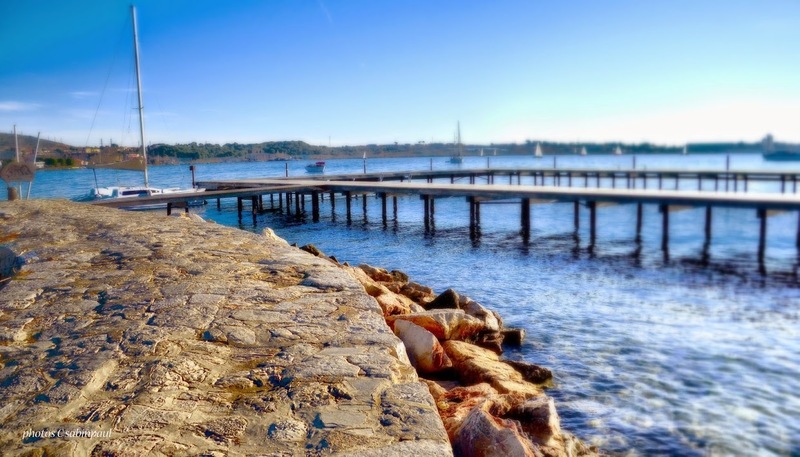 This part of France at l’Étang de Thau (the Thau Lagoon) produces a rich diversity of fish & shellfish, ánd the wines to go with it – what more can you wish for? This Piquepoul white is called ‘Les Terres Rouges’, after the vineyard’s red clay, and it’s a vibrant, refreshing wine with high citrussy acidity and a distinct bitter touch, which balances the ripe orchard fruit & floral tones. This tension makes it a versatile seafood partner, from oysters, mussels & sushi to freshwater fish & lobster croquettes. G. Bascou 2015, Domaine de la Condamine L’Evêque. Made by an important winemaking family in the area, this is a good representative of the Picpoul de Pinet character and a pleasing, refreshing wine, which went – again – very well with oysters ‘natural’. Aromas and flavours of freshly squeezed lemon juice, citrus pith and chalky mineral impressions, carried by medium(+) acidity and body, to a medium-length finish with a pinch of grapefruit. Classique 2015, Domaine des Lauriers. Like so many Picpoul de Pinet wines, this one needs the right food partners to shine. Sure, you can drink it on its own as a refreshing summer sipper, but it isn’t until you pair it with oysters, shrimps, salmon or lobster dishes, that it gets to reveal how well its lemon juice, citrus zest, apple and peach aromas, its juicy citrus acidity, salinity and just a touch of roundness, complement the taste and smells of the sea. Not the most complex of the wines we tasted, but a correct, honest and highly quaffable wine that will appeal to a wide audience, even more so if they love seafood. Château Castelnau 2016, Domaine de Castelnau. A lovely, ripe and complex Piquepoul white with light mineral notes, a pinch of spice, a drizzle of honey, even a slice of oven-fresh bread, and above all: fresh and juicy fruit, from apples, pears and peaches to lychees and pineapple. Vivid acidity and a creamy mouthfeel drive a medium(+)-length finish, which ends on a lemon pith and grapefruit-bitter note. An attractive wine that will appeal to many and pair well with Asian seafood salads and fried seafood appetisers such as prawns, calamari & croquettes.